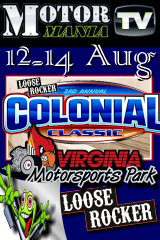 Dinwiddie, VA - Live Coverage from the Loose Rocker Promotions Colonial Classic goes live Friday morning 8 am E.S.T. 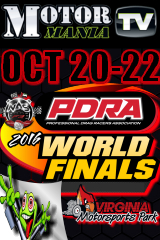 and continues thru the weekend at Virginia Motorsports Park in Dinwiddie, VA. Click Here for Live Video and Chat. 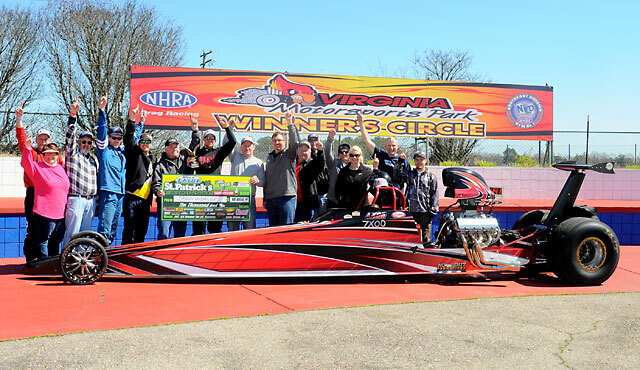 Dinwiddie, VA - Jeg Coughlin Jr., Charlie Kenopic, Joe Tysinger and Randy Parker each scored big wins at the Virginia NHRA Nationals and the NHRA Lucas Oil Drag Racing Series at Virginia Motorsports Park. North Dinwiddie, VA - In the MXI/Magnaflux Top Dragster and Top Sportsman presented by Select Performance it was a busy weekend for local racer Mark Payne, from Waynesboro, Va., who raced in both classes taking home victory in Top Dragster and a close runner up finish in Top Sportsman. North Dinwiddie, VA - Congratulations to Jason Weaver for picking up the Top ET $15K Main Event win over Friday's winner, Jeff Serra. In Footbrake, Devin Dudley earned his second career Loose Rocker Big Check, stopping Chris Dixon, another former Loose Rocker winner, in the finals. 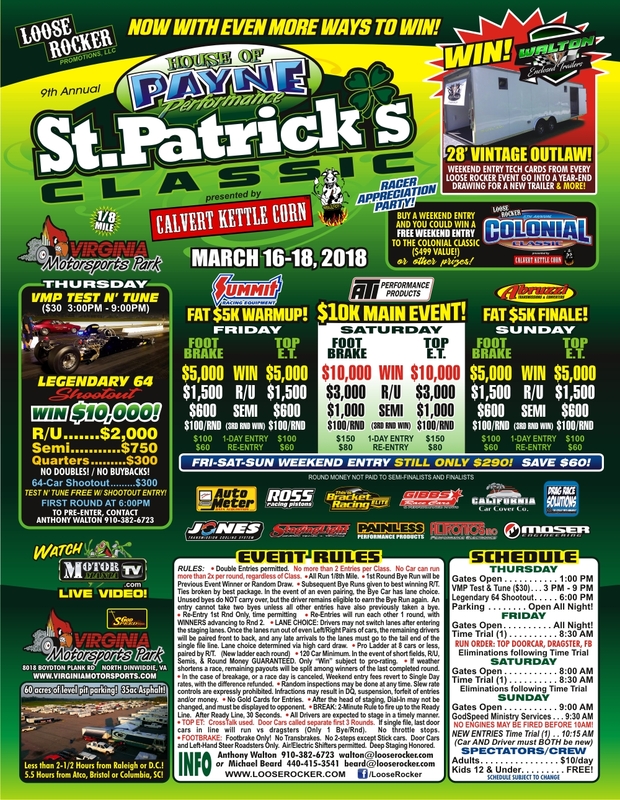 North Dinwiddie, VA - Live Coverage of the Loose Rocker Promotions St. Patrick's Classic at Virginia Motorsports Park in North Dinwiddie, Virginia kicks off Friday morning at 8 a.m. sharp. CLICK HERE for Live Video and Chat! 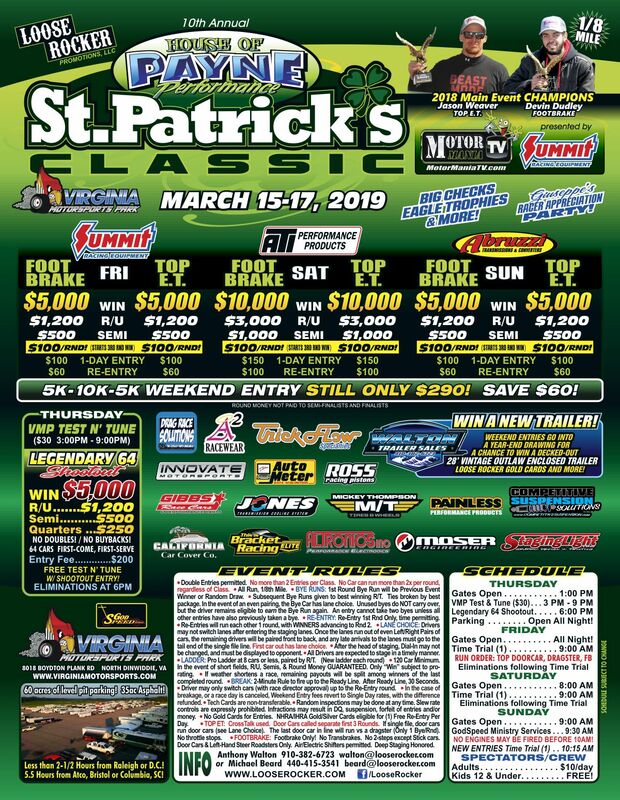 Dinwiddie, VA - The NHRA Lucas Oil Drag Racing Series picked up from where it left off in April at Virginia Motorsports Park, after mother nature forced the event to be moved to this past weekend. 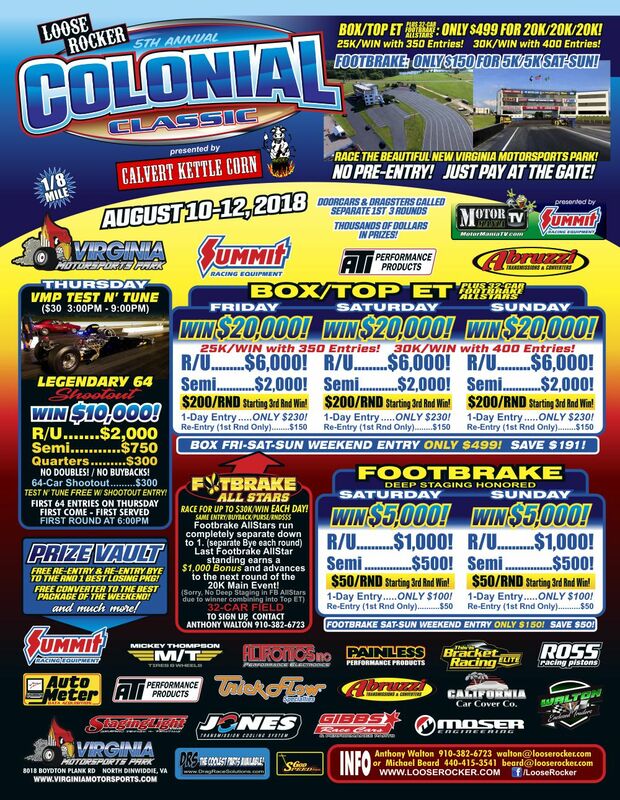 Dinwiddie, VA - Live Coverage begins 8 am Friday morning of the 3rd Annual Looser Rocker Colonial Classic at Virginia Motorsports Park in Dinwiddie, Virginia. 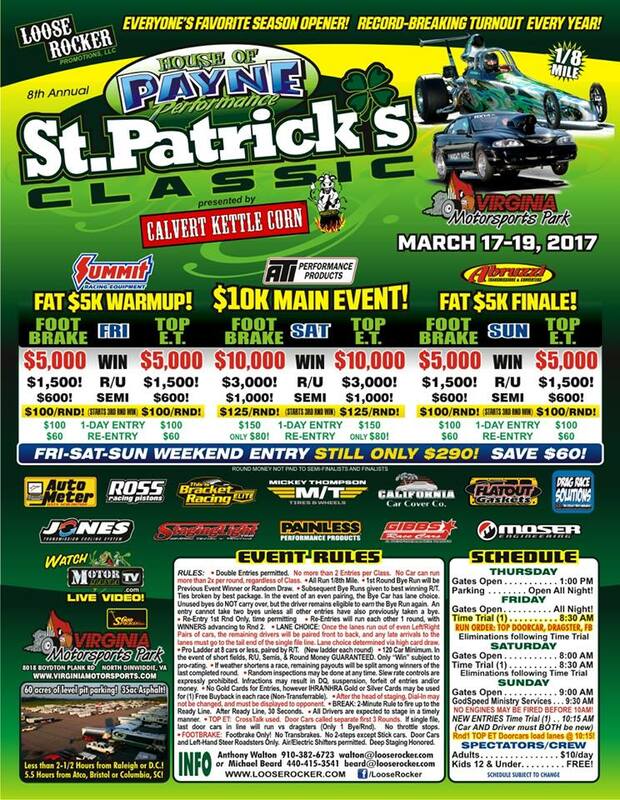 Top Bulb and Footbrake Racers compete for Big Bucks in this 3 day event. CLICK HERE for Live Video Coverage.